Finding the right folio case for an iPad has become a bit easier of a proposition since the first model came out two years ago. There are now several companies like Pad & Quill and DODOCase, that make very nice options for those who want that ‘book like’ feel for their cases. The new Fieldfolio for iPad and iPad 2 is a really great alternative to other folio cases that I’ve tested and has some unique features that make it one of my new favorite recommendations for those in the market. The Fieldfolio looks very similar at first glance to something like the DODOCase, with a more ‘dressed down’ feel than the lovely leatherwork of the Pad & Quill. Where it differs from either of the others is that it uses a tough plastic cradle rather than the wooden frames of the others. As someone who has personally seen, or caused, several cracked wooden cases for iPad, I can attest to how tough the cradle of the Fieldfolio is. I’ve personally seen it take some abuse, as the dings along the edge of the cover can attest to. The exterior is a pleasant linen finish that didn’t pick up dirt or finger grease much at all in the weeks that I tested it. There is a simple, subtle, logo stamped on the spine but nothing that jumps out and pounds you in the eyeball. 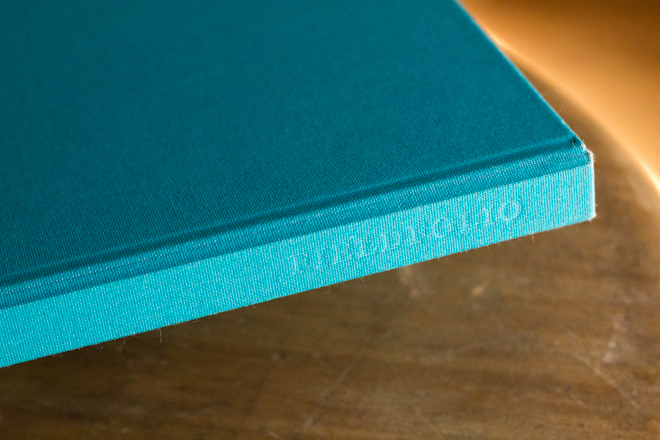 The logo is also stamped along the exterior edge of the Fieldfolio’s frame, but once again, very low-key. 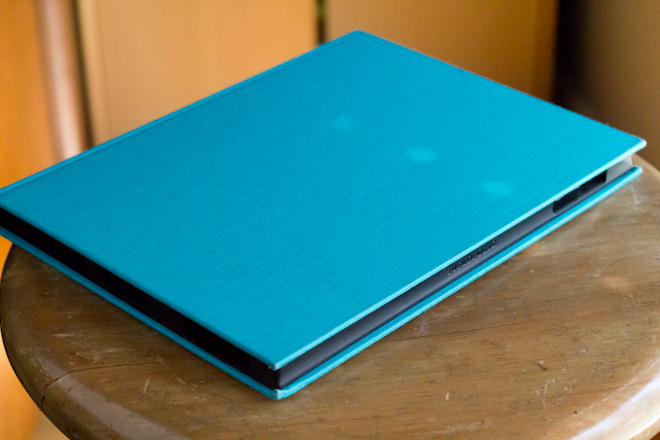 After using the case for several weeks, the linen at the very corners of the binding has a pleasantly worn look, just as any linen bound book wood. It’s a nice effect and one that doesn’t bother me in the slightest. If you’re not one to like wear on your products its something to be aware of though. The case also comes in a a variety of colors including black, gray, blue, orange, pink and green. 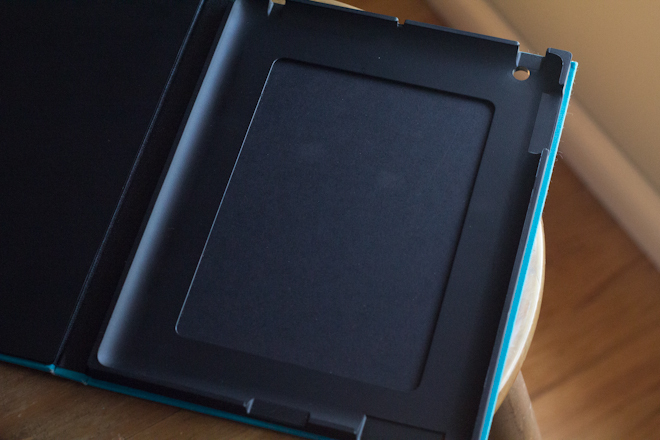 I’ve tested my case on both the new iPad and older iPad 2 and it works fine, although the Fieldfolio site specifically states ‘for iPad 2’, so have no fear if you’re looking for a case for your brand new tablet, this will work just fine. 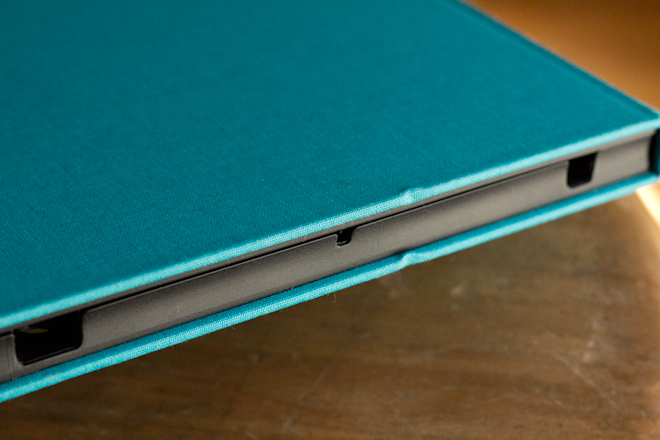 Some of the details that the plastic casing allows are nice. The camera hole in the back, for instance, is clear of obstruction and built right into the cradle. 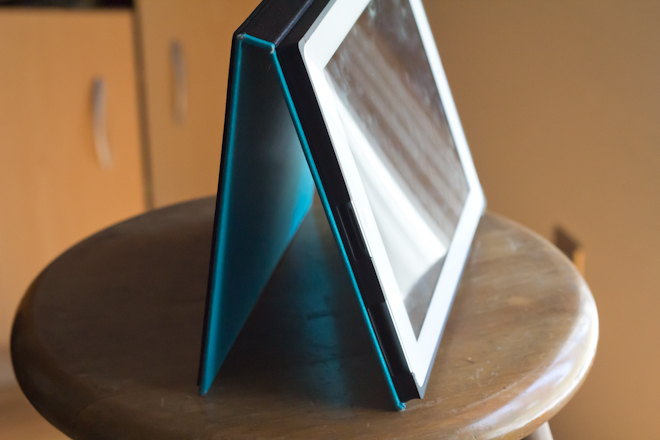 Many folio cases for iPad don’t have a hole at all or have a very deep one, causing it to have issues with vignetting. The front cover of the FieldFolio is also backed in a nice thick piece of plastic, protecting the screen well from impacts to the front of the case. 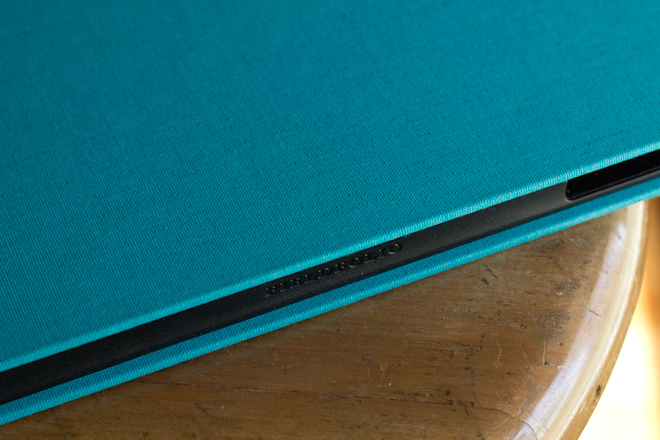 The Fieldfolio also has magnets that will trigger the auto-on/auto-off function of the iPad and I am pleased to note that it does not suffer from the accidental triggering issue I’ve seen with other folio cases. There is little to no ‘slip room’ available in the binding, meaning that you can carry the case edge down in your hands without having to worry about the front cover slipping back to trigger the screen on and off. 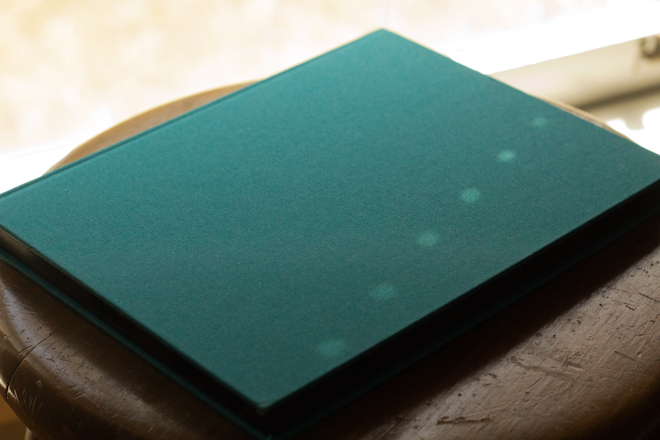 This is an annoying side effect that I’ve noted in other folio case reviews and its nice not to see it here. All of the ports and openings are blissfully roomy as well, likely due to the molded plastic being easier to work with around the edges and not as brittle. This is also likely why the iPad rests almost completely flush agains the edges of the frame, making for little wasted room or ridges. The Fieldfolio is also a bit cheaper than other options that I’ve seen in this space, at $69. That’s a great value for a case as well designed, tough and beautiful as this one. It’s become a favorite in the household, especially as it makes for a great ‘grab and go’ case that you don’t have to worry about as much as one backed in leather or with a fragile wooden frame.